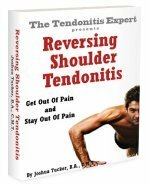 Most people think that they have a Rotator Cuff Injury when they really just have a tendonitis dynamic. It's important to know which...because you'd hate to have surgery when you don't need to. There are four muscles and four tendons attaching to the rotator cuff*. If there is a rip or tear on/in any of those, the that falls in the category of rotator cuff injuries. * Biceps tendons, pec major tendons and a few others are right in there too, but they're not considered to be 'rotator cuff' structures. If you just have pain, even debilitating pain, but no rip or tear, then you just have tendonitis. Do You Actually Have One? So. Do you have a rip or tear in/on the tendons of the infraspinatus, supraspinatus, teres major or teres minor? 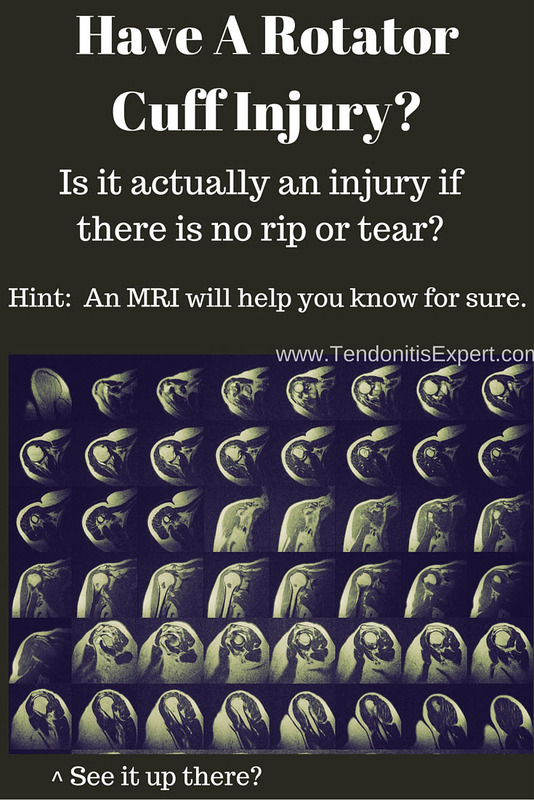 You would need to answer that question via an MRI, or with testing from a skilled sports medicine practitioner (doctor or physical therapist or a few other options). If you just have a lot of pain, don't presume that you have a rotator cuff injury. Maybe you do, maybe you don't. But 'pain' isn't an accurate indicator of injury or lack of injury. And a rotator cuff tear of a tendon can cause anywhere from no pain to debilitating pain. So again, pain can be a helpful clue, but is not proof positive for diagnosis purposes. If it has been determined that you DO have one or more specific rotator cuff injuries, then what? Can the tear heal (satisfactorily) on it's own without surgery? First, lets talk about whether you need Rotator Cuff Surgery. If you just have Rotator Cuff Tendonitis, then you don't need surgery (because tendonitis is reversible without surgery). But, you have determined that you DO have a rotator cuff tear. An actual injury that needs to be dealt with. There's nothing that can be done so you'll just have to live with it. This is relatively rare, when the damage location and the degradation of the tendon is so bad there's just really nothing to be done for it. Don't do anything and hope it heals. It's not bad enough, or it won't affect your life to warrant the cost and risks of repair surgery. Surgery to repair/reattach the pieces of the tendon. 1. You'll just have to live with it we can't fix it. Tendon can degrade so badly that instead of tearing it just sort of falls apart. This makes for a larger area of destruction. Sometimes it's just too much to do anything about. This is pretty rare, and usually relates to the smaller structures. 2. Don't do anything and hope it heals. This can be a response for partial or even total tears. If the tear is small, then the doctor hopes that it will heal on it's own. And that the impact on your life is relatively small (of course this is the doctors assessment not yours) and doesn't warrant the cost and risks and other downsides of surgery (for instance, the painful recover time). If it's a total tear, it's usually going to warrant surgery. But sometimes, again, the determination may be that the loss of function isn't that big of a downside to you. Surgery isn't cheap and isn't without downsides. For older people with rotator cuff injury, the case -can- be made that while living with the tear isn't optimal, surgery can offer more downside than upside. And doctors tend to be very optimistic. "Rest and do PT and come back in a couple months if it's not better." 3. Shoulder tendon reattachment surgery. While doctors are often overly optimistic, surgeons have a reputation for 'Obviously you need surgery'. If you have a big tear, you most likely do. If you have a big tear, it's incredibly unlikely to heal back on its own. Personally I'm not a big fan of surgery, AND, sometimes surgery is necessary. Reattaching completely torn rotator cuff tendons is generally one of those times. If you are told that your 'injury' is microtrauma (teensy tiny wear and tear damage) on a tendon, that's just Shoulder Tendonitis, and no big deal to fix. If you have a small tear, 15% or less, you have a shot at healing without surgery.....IF you do effective self care to reverse the factors that caused the tear in the first place. If you have a big tear, then surgery is probably a good idea. Because that tear just isn't going to heal on it's own. It -might- seem like it's healing you might regain strength and notice less pain but it's almost certainly going to tear again at some point. So deal with it now, or deal with it even more, later. One way or another, a Rotator Cuff Injury is not something to be ignored.....you're going to need to do something for it if you want the best chances of recovery. Return to the top of this Rotator Cuff Injury page.